Introducing realistic 3D Website and App Mockups for your website or app for make a design presentation in few seconds. These PSD files are using the Smart-Object, so you can replace the mock-up content easily and quickly. 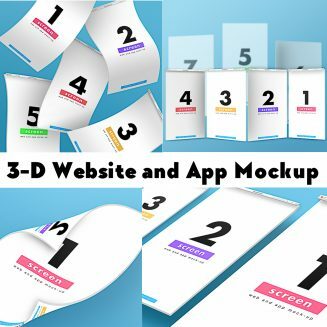 In this pack you’ll find 10 unique real 3D perspective mock-ups. Tags: 3d, 3d app, 3d ipad, 3d mockup, 3d page, 3D Web Page, app, desktop, display, iPad, iphone, perspective, presentation, showcase, tablet, web, web app, website, website display, website template.